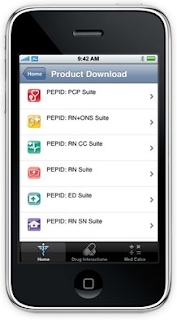 PEPID ED Platinum brings the vast and well known PEPID database to the iPhone and iPod Touch via a wireless internet connection. A comprehensive (and much easier to carry than a textbook) mobile reference for the emergency department. PEPID ED Platinum can be purchased here. PEPID is also available for Blackberry, Windows Mobile, and PalmOS.